A heart-lung machine is a pump that is used to maintain blood circulation and the supply of oxygen to the body during surgery which requires a cardiopulmonary bypass (CPB). The machine is commonly referred to as a CPB pump or just as “the pump”. Cardiac bypasses are commonly used for surgeries on the heart and its chambers. During CPB, blood must bypass the lungs and be circulated and oxygenated mechanically. The heart-lung machine maintains blood supply to all organs and tissues other than the heart and lungs, providing surgeons with a blood-free surgical field in which to work. Blood is withdrawn from the heart via a cannula placed in the right atrium, the vena cava or the femoral vein. The blood is filtered, warmed or cooled as needed, oxygenated and returned to the body, into either the aorta or the femoral artery. An anticoagulant is added to the blood to prevent clotting. Heart-lung machines are comprised of a chamber that receives the blood from the body, effectively replacing the right atrium of the heart, as well as a pump and an oxygenator. The pump takes on the function of the right ventricle, while the oxygenator plays the role normally assigned to the lungs. 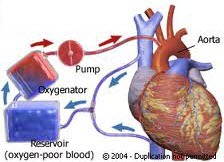 Together with a series of silicon or PVC tubes, the elements of the machine remove oxygen-depleted blood from the patient’s body and replace it with oxygenated blood, which is then circulated throughout the body by the pump, and now mimics the function of the left heart. Heart-lung machines may use centrifugal or “roller” pumps. Roller pumps massage the tubing with a peristaltic action that gently pushes blood through the tubes. Increasingly, they have been replaced by centrifugal pumps, which generate blood flow using centrifugal force from alterations in the speed with which the pump head revolves. Centrifugal pumps are less likely to damage the blood and are therefore preferable to roller pumps. The oxygenator of a heart-lung machine removes carbon dioxide from the blood and infuses it with oxygen. Currently, both membrane oxygenators and heparin-coated blood oxygenators are in widespread use, although heparin-coated oxygenators are thought to cause less inflammation and reduce the likelihood of blood clots in the heart-lung machine. A large number of manufacturers produce heart-lung machines, including Salyer Biomedical, Terumo Cardiovascular Systems, Stockert GmbH, Baxter, Abiomed, Sarns Perfusion, Cobe Cardioascular, Medtronic and Getinge Group’s Maquet unit. This machine is really very helpful for patients with heart condition. Luckily, someone invented this machine.